The mux rate of the display. Luckily, both of these things are well within our control, and an understanding of these two characteristics should guarantee an acceptable design. We will make a leap of faith here and assume that there is enough voltage available to properly drive the display, so it should not be an issue. If you need a refresher on driving voltage, go to our Optimum Drive Voltage page for a quick recap. When considering the multiplex rate of a liquid crystal display, the best advice I can give can be summed up in a single word, don't. Nothing good happens when a display is multiplexed, and it should be avoided at all costs. The display contrast, viewing angle, and temperature range all suffer, and knowing this, the design goal is to minimize the damage by keeping the mux rate as low as possible. The reason for this degradation is simple. When a display is multiplexed, it is essentially driven a time-division manner. That is, a segment, or a set of segments, are activated for a short time slice. These segments are then allowed to turn themselves off while a second set of segments is turned on. This back and forth time slicing means that each segment set is not really turned on all the way, and they never really turn off all the way. They operate in a region that is a compromise of drive on and off voltages. The higher the mux rate, the less time a given group of segments is being addressed , and the worse the display will look. If you refer to our "Basic Operation of an LCD " page, it is easy to see that this is not a good situation. As a practical matter, a mux rate of 2:1, 3:1 or maybe even 4:1(?) for a normal TN display will not really damage the contrast and viewing angle very much. For mux rates above 4:1, serious degradation sets in. At that point, a switch of drivers or a move to STN technology are the options. As can be seen, the voltage threshold of this fluid is not linear across its entire temperature range, however, it is relatively constant for a range of "about" -20oC to 85oC. 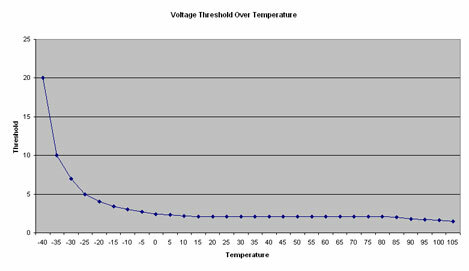 The threshold graph does however go up rather steeply when the temperature range gets down to about -25oC. The "about" point on the graph is in the eye of the designer, and it must be understood that this is not a number that is cast in stone, but rather an interpretation of the data. It may be stated that a display built using the above hypothetical fluid, will have an operating temperature range of -40oc to +105oc when used in a direct drive mode. However, it can be seen that at -40oc the drive voltage goes to an impractical level. The result of this non-linearity is that you need to increase the drive voltage at low temperatures for an acceptable looking display, and lower the drive voltage at higher temperatures to prevent "ghosting". In most applications, a temperature range of -40oc to +85oc is sufficient, however for unusual applications, fluids are available with operational temperature ranges as low as -55oC and as high as +125oC. Fluids that have relatively flat response curves from -40oC to +85oC are readily available.